Android Central got their hands on a new Android phone: the HTC Merge, an 800 MHz Android 2.2 phone headed to Verizon. 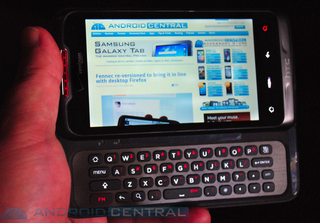 It's a World Phone that uses HTC Sense and has a sliding keyboard similar to the T-Mobile G2. Truthfully, the Merge isn't anything out of the ordinary. Other than having a decent looking physical keyboard, the Merge's specs—3.7" screen, 800MHz processor, 5-megapixel camera, 720p video—seem to be in line with the average Android phone. On the software side, it's running HTC Sense and because it's on Verizon, it uses Bing for search. I'd be smitten with this device if I loved Sense and needed a physical keyboard, though.